My back garden is filled with birds — bluebirds, mourning doves and common crows, chickadees and robins. They’re ordinary inhabitants that provide endless inspiration and entertainment, keep me company over coffee at sunrise and sing to me in the dark. I think a pair of doves is building a nest in the big navel orange tree beside my kitchen window. I see them flying in and out as I cook and wash dishes. 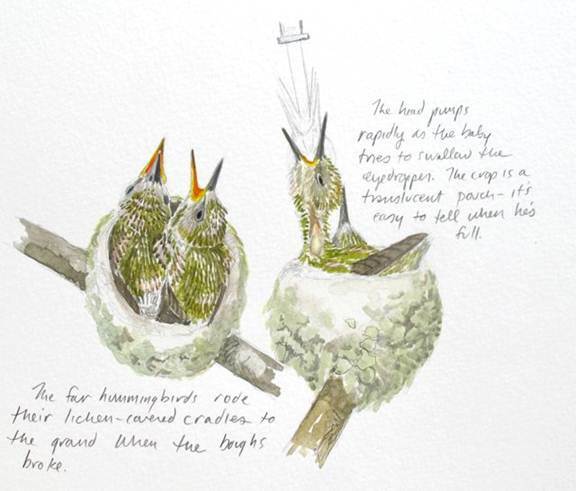 These kinds of common birds sparked the interest of acclaimed wildlife illustrator Julie Zickefoose, who lives in the southeast corner of Appalachian Ohio. 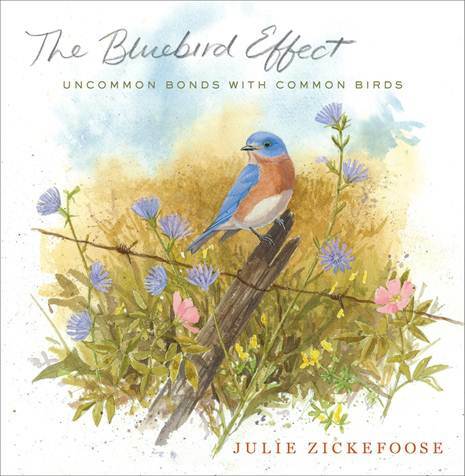 Her remarkable new book, The Bluebird Effect: Uncommon Bonds with Common Birds offers an intimate look into her experiences as a wildlife rehabilitator. But it’s much more than a collection of bird stories. Each of the 25 species of birds Julie profiles is brought to vibrant, intelligent life, with a wealth of natural history and behavioral observation that only someone who’s lived with birds could supply. This is a beautiful book from a bonafide expert with unique talents. Leafing through the pages is an easy reminder of one of the many reasons why we flock to gardens and parks. See you in the garden and bring the binoculars and a field guide. I can’t begin to name all the birds I see! 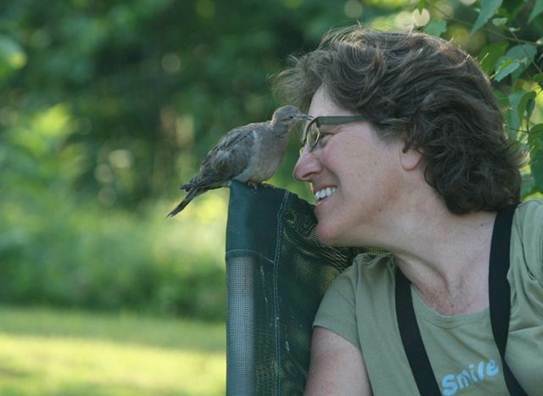 “It often begins,” she says, “with a phone call from someone who’s found a baby bird and wants to bring it over.” Julie is a licensed wildlife rehabilitator who has been answering such calls since 1981. A National Public Radio commentator and a contributing editor to Bird Watcher’s Digest, her lucid writing style, delicate illustrations and a childlike wonder combine to create a book of beauty, philsophy and practical information. She says it’s the interaction between birds and humans that fascinates her most. Julie began illustrating natural history subjects as a freshman at Harvard in 1976. After a six-year stint as a field biologist for The Nature Conservancy, she turned to freelance writing and art. Since then, her work has been featured in Bird Watcher’s Digest, on NPR’s All Things Considered, and her book of illustrated essays Letters from Eden: A Year at Home, In the Woods, has attracted a following. She and her husband Bill Thompson III, editor of Bird Watcher’s Digest, live with their two children on 80 acres in Washington County Ohio in a house with extensive gardens, an art studio and a 42-foot bird-watching tower. 185 species of birds and 78 butterfly species have graced their sanctuary to date. Thank you so much for posting this on your blog, Kate! I'm excited to see the art and your analysis. Beautiful blog!